IT’S A CONTEST! Win a $20.00 credit to my etsy shop!! What can I do with this??? 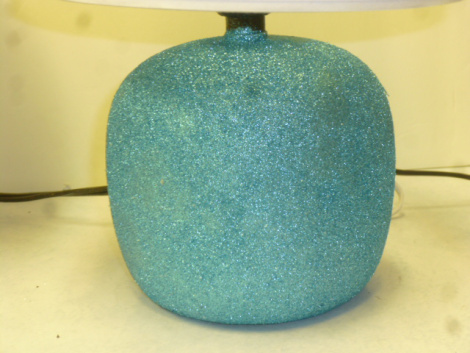 Remember this fabulous turquoise GLITTER lamp that I made a while ago?? 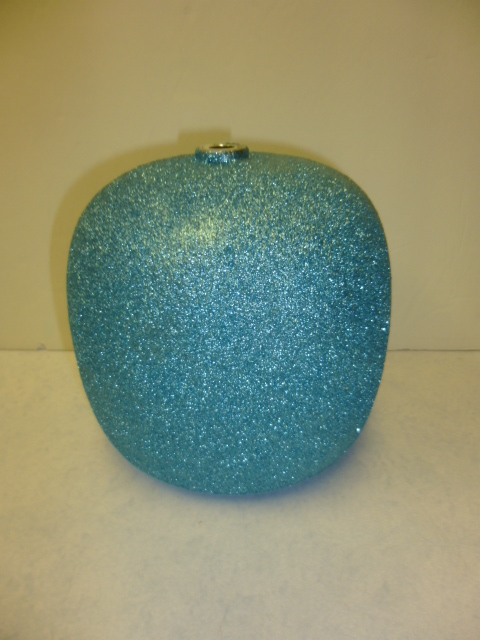 I had just coated the base with several coats of glitter and glue. Once completely dry I apply a couple of coats of clear spray to ‘set’ the glitter and minimize it’s ‘shedding’. 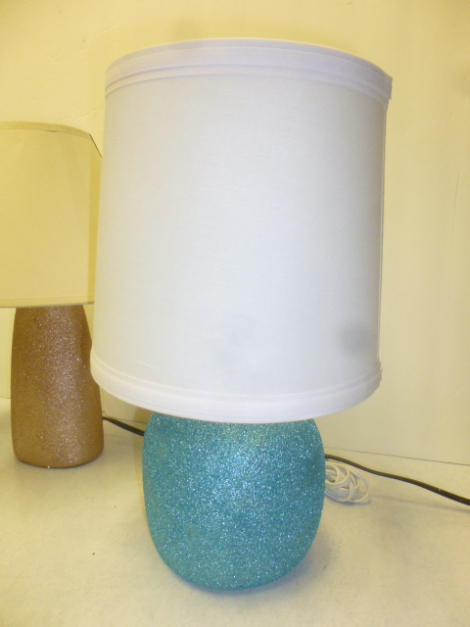 Add a shade and a bulb and it’s ready to sell. Alas, THIS is all that is left of it at this point! It apparently got knocked over one too many times while on display in my booth at Stars and the switch broke. Now I KNOW I ‘could’ buy the parts and replace them and re-wire the lamp; but I wanted to come up with ‘something else’ UNIQUE to do with it. I already have that ‘something’ in mind, but I thought I’d also ask for YOUR ideas and input. And since it’s ‘Christmas time’, why not make it a contest with a PRIZE?!?! So, here’s the deal . . . leave your suggestions as comments to me. Whomever has the BEST and most unique idea (OR actually guesses the same idea as I already have for it) wins a $20.00 credit to spend in my etsy shop. There is a small hole on the top of it where the wire came through; and a small hole where the cord came out in the back (that can easily be ignored) but the hole on top will have to be ‘dealt with’ in some way in your suggestion. Put on your thinking caps and start thinking . . . . . What would AJ do?!?! I think I would make a ‘topiary’ type thing out of it, stick a dowel in the top with a large snowflake or star at the top about 8″ from the base, depending on the size of the base itself. My idea: Fill the top hole with a pre-drilled piece of dowel. Use wire fitted into that drill hole to hold a glittery halo. Run sheet music through a shredder & curled with the edge of a scissors to make a headful of hair. If the angel needs a face perhaps use pieces of misc metal. Wings? As I am an avid gardener [flowers] and love to be outside I make a lot of yard art from vintage finds such as kitchen glass ware, plates, bowls and other pretties. Why not make a whimsy yard art piece? Base for a white/tinsel Christmas tree, like your bottle brush trees, but on a large scale. I think that if you had a decorative Christmas ornament or a starfish shaped decoration that was placed onto one of those wire coils to hold a picture, a letter, or message onto it. It could sit on a desk or in the center of a dining table as a centerpiece. Enlarge the top hole and use as a vase for a flower arrangement. Here is exactly what I would do…I would make a ‘crystal’ ball with Madam Leota from Disney’s Haunted mansion for a Halloween prop! Find a clear ball shaped light fixture globe. (I’d try Habitat for Humanity first) Then a doll head that would fix through the hole, but not be too small. I’d glue the doll head to either a section of pvc pipe that would fit inside of the hole at the top of the lamp base or a section of a wooden dowel to do the same. Put the doll’s head on the stick/pipe then into the lamp base. Glue if needed. Then tease and back comb the doll’s hair to look crazy and mostly fill up the globe. Paint the hair with white spray paint and hand paint her face so that her eyes really stand out. (I’d add false eyelashes) maybe even paint her skin a creepy green color. When she looked really creepy, I’d glue the clear globe to the top of the lamp base and over the doll’s head. I LOVE Halloween so I think this one would be way cool and magical!